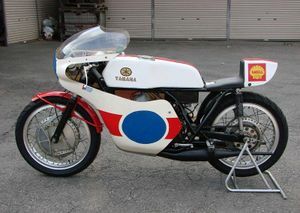 The last 350cc aircooled production roadracer Yamaha ever produced, the R5 roadbike based TR3 was released in 1972. 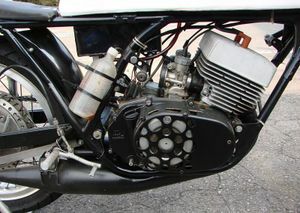 Changes to the bike including bore and stroke configuration, the engine now sported the 54mm stroke that was to be the mainstay of the TZ range for the next 8 years, a rise in compression ratio, well as a new crank and a 6 speed gearbox replacing the old 5 speed, though as for the TD3, provision to "block out" sixth gear was there. Like it's "little brother" it didn't live entirely up to expectations either, also suffering from detonation and seizures at regular intervals**. Peak horsepower rose by 2 to 58bhp. The wheelbase of the TR3 increased by 15mm over the old TR2B while all other dimensions apart from overall length remained the same. An interesting point: The some of the "works" TR3 engines from 1972 sported 6 transfer ports, like an F/G model 350. It took Yamaha 7 years to let us all in on the secret !! The good news was the big news from Yamaha later that year, there was a major change on the way ... water-cooling !! This model enabled Yamaha to capture its first win at the Daytona 200. 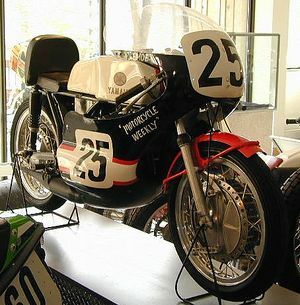 The winning TR3 was piloted by Don Emde. 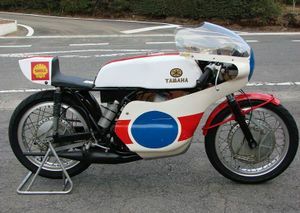 This started a streak of 13 consecutive wins at Daytona by Yamaha (1972 ~ 1984). This is a feat that will, more than likely, never be equaled. This page was last edited on 10 December 2010, at 02:17.